Upland Cress: A Free Lunch! Last summer, the state re-did the road in front of my house, in conjunction with a bridge project. As part of improving the drainage, the project had the unfortunate side-effect of emptying my well, which means a new (and much deeper!) well had to be installed. Every dark cloud has a silver lining though! Putting in a new well resulted in my side yard being torn up, and one thing that thrives in disturbed soils is cress. As a kid, in spring, my father would take me to gather cress, which we prepared like spinach and served with apple cider vinegar. I’ve always loved wild cress. So in the wake of the well project, that whole area was covered in cress! Rather than tear it out and seed with grass, I let it all go to seed with waves of tiny yellow flowers. When ready, I collected thousands of seeds from it, which I will be sowing in my garden early this spring! It is best harvested young and before it goes to seed for best flavor. There are several varieties of wild cress in North America, but this particular variety is Barbarea verna, a close relative to the mustard family, is a biennial that makes seeds every other year. Garden cress (for which you can find seeds at the store) is an annual. In terms of flavor, wild cress species vary from barely edible to delicious. Cardamine bulbosa (also known as bitter cress) is a perennial with white flowers, that is best eaten cooked whereas the Barbarea verna variety can be eaten fresh. So now I have thousands of seeds of a delicious wild edible I enjoyed in childhood. I can’t wait for Spring! Filed under: Cress, Seeds, Self-Sufficiency | Comments Off on Upland Cress: A Free Lunch! I have been dehydrating foods for 20 years, starting when I was down on my luck and had to live on a $30/week food budget. Now I do it because it helps me process large harvests and helps me make some of the best convenience foods! I covered the essentials of dehydrating in MiniFarming: Self-Sufficiency on 1/4 Acre, but The Dehydrating Bible goes into a lot more depth. This book covers the how and why, including the science that underlies dehydrating. It describes everything you need to know about pre-treatments, marinades, storage and more. But just like in my other books, I don’t just tell you “what to do.” Instead, I explain the underlying principles and ideas so you have the knowledge to create your own marinades and recipes and handle situations that might not be specifically covered in the book. The Dehydrating Bible covers proper and safe preparation, pre-treatment and dehydrating of fruits, vegetables and meats. But it also covers herbs and spices, and has a chapter dedicated to step-by-step instructions for building a cost-effective dehydrator large enough to handle big harvests. I give a lot of helpful hints that come from long hands-on experience so you’ll be an expert yourself in no time. But the most useful feature of the book, the aspect you’ll likely use the most, is the section of recipes for making your own soups, stews, salad dressing mixes, and convenience foods like instant oatmeal and instant mashed potatoes. A long time ago, I was living pretty much hand-to-mouth and I would do most of my cooking in a thermos. I grew vegetables in a secret plot under some high voltage lines. I couldn’t always afford to keep my electricity on. Over time, I developed a ton of recipes for making and combining dehydrated foods to make delicious and healthful meals. The food was so good, even today my daughter sometimes asks for me to make it for her. I’m not living hand to mouth these days, but the recipes remain and are just as good — and I share them with you in the book. If you have undertaken Mini-Farming, you likely have some really large harvests to handle. The large-scale dehydrator I describe in the book can have twice the capacity of the largest countertop dehydrators and costs less than half as much to build. Combined with canning, freezing and pickling, this will help you put away a lot of veggies in a short time! 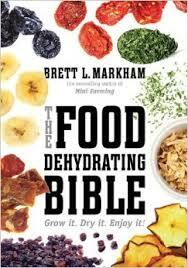 The Food Dehydrating Bible is available from Amazon, Barnes and Noble, Indie Bound and independent bookstores. It’s Out! The Modern Caveman! It only stands to reason that a guy who cares enough to grow his own food, and develop methods for doing it effectively as part of a modern lifestyle, is concerned with diet and exercise. 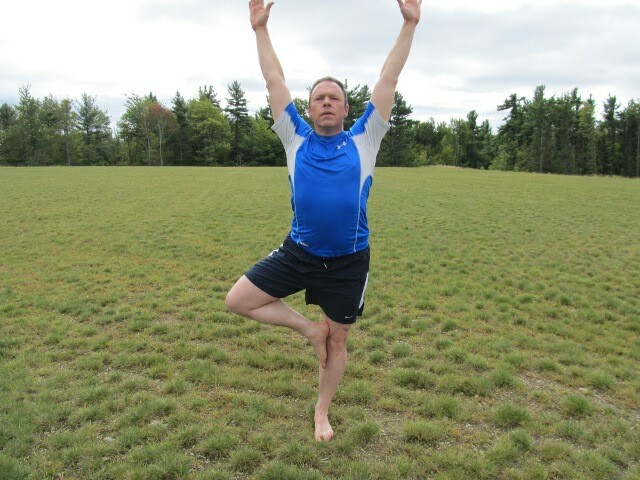 After many years of research struggling with autoimmune, blood lipid and gastric issues, and doing a tremendous amount of both laboratory research and study, I decided to first go gluten-free, and then adopt paleo diet altogether. 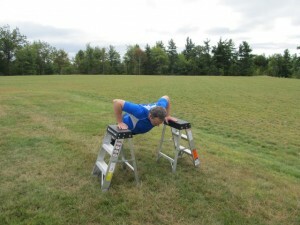 The result is that at 49 years old I can run hurdles, do martial arts and feel great! My blood lipids, blood pressure and other objective measures of health are what they were when I was 18. I look and feel great! So can you. Paleo diet has now become trendy, so when my publisher first approached me to write a book on the topic, I refused. I have absolutely zero interest in chasing trends just to make a buck. When I write a book it is to address a specific need, to address it comprehensively, and to address it in a unique and enlightening way that actually helps people. If it happens to make money, that’s great — but a secondary consideration. My reputation for writing worthwhile books that help people is more important. But I looked at existing books on the topic over the next six months, and I discovered they were either of overall poor quality, inadequately researched and accompanied by hyperbole, completely neglected important aspects of diet such as gut bacteria, ignored the concepts of evolutionary exercise, or were needlessly laden with jargon people don’t understand. Modern Caveman is comprehensive. Not only does it contain over 200 citations of studies and other research to backup its claims, but it thoroughly explains not just what you should eat, but why. Just the chapter on oils and fats is worth the price of the book, because it demystifies the mumbo jumbo and alone might save your life. Because I had answered questions for friends about paleo diet for years before writing the book, this book is written to answer nearly every question you might have. How your gut bacteria sabotage your efforts to change your diet, and how to fix that problem. 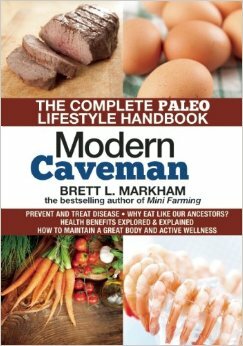 Caveman lifestyle issues beyond diet, and their impact on mental and emotional health. Why birth control pills should not be used to treat acne in teenage girls. A complete progressive scalable exercise regimen based on solid research that will keep you in peak health and can even be started by desk jockeys. In only 30 minutes three times a week! Why what your coach in high school taught you about stretching is wrong, and what you should really be doing. Maintaining your sense of balance and proprioception into healthy advanced age. Maintaining and enhancing your fertility (for both men and women) and attractiveness. A full explanation of lectins and their evolutionary role. Modern Caveman is obviously a large book, but don’t let that dissuade you. Despite the academic citations and underlying science, all of the biochemistry is explained and the information is presented in an entertaining way with humor sprinkled throughout! Most importantly, not only will you love this book, it will literally change your life. It demonstrates irrefutably why a caveman diet is not just a fad: it’s the real deal. It’s a way of eating, moving and living that will add real quality to your life, every day of your life. You can buy Modern Caveman at Amazon, Barnes and Noble, Indie Bound and at fine independent book stores such as Toadstool. Filed under: Books, Diet, Exercise | Tagged: Caveman diet, High Intensity Interval Training, HIIT, Lectins, Omega-3, Omega-6, Paleo diet | Comments Off on It’s Out! The Modern Caveman! I typically write about matters of farming, food preservation and nutrition. I figure since most folks are familiar with me through my books on these topics, that’s what they’d be seeking here! But though I have no intention of writing regularly about the topic, I think ham radio has a place in these discussions. One of the major benefits of growing and preserving your own food is that you are well prepared for an unforeseen emergency long before an emergency occurs. The time to start raising your own food is *before* all the supermarket aisles have been cleaned out. The time it takes to start seedlings and grow food to the point of useful harvest is long enough that you’d starve while waiting for the food — so it is something you should have running all along so you are already prepared no matter what time of year an emergency occurs. And if there is no emergency? Well, you’ll just have superior food while saving a ton of money in the meantime! People are generally aware of the risk of food shortages, which is why you’ll see grocery stores cleaned out just before major storms. And they are aware of the risk of electrical outages, which is why so many people buy generators. But few people are aware of how delicate our communications infrastructure really is. In 2008, my region was hit with a major ice storm. Practically every utility pole in my town was snapped. Trees and utility poles littered the roads, making them impassable for three days. Nobody in, nobody out. I don’t live in Alaska or the backwoods of Montana. I live within a 90-minute drive of Boston, so this scenario is not a far-fetched thing that can only affect people living in the hinterlands. There was no electricity at all in the region for anywhere from six to twenty days. There was no land-line phone, and no cable service. But what most people didn’t expect was the lack of cell phone service. The cell tower backup generator ran out of fuel before the downed trees could be cleared sufficiently for fuel to be brought. The ONLY communications out of the area were by radio. VHF radio and UHF radio is strictly line-of site. The reason the VHF walkie talkies work over longer distances is because of repeaters. But the repeaters had no power after their backup batteries were exhausted. So the only communication was via satellite (for those equipped for satellite communication) or HF (high frequency) radio. And this is where low power Morse code shines. In ham radio speak, that is QRP (low power) CW (continuous wave a/k/a Morse Code). A SSB (single sideband) voice signal requires 2Khz of spectrum, but a CW signal requires only 200 Hz of spectrum. Because of the power density, a 5-watt CW signal is more easily detected and interpreted than a 100-watt voice signal. And these low power CW transmitters can work for hours and hours on small 5Ah and 7Ah sealed lead acid gel cells or for days and days on a car battery. Of course, just as it would have been too late to start a garden and feed the family in the midst of an ice storm, it would have been too late to develop ham radio skills too. The time to have the garden and saved food is before you need it, and the time to have ham radio skills and gear is before you need them. In the aftermath of the ice storm in 2008, we wanted for nothing while the infrastructure in the region was rebuilt. We already had plenty of food set aside, and I harvested fresh eggs from the chickens that we fried on the wood stove. And though I didn’t need to make any emergency communications, my station was at the disposal of local authorities should it be needed. I felt better knowing that if those radio skills were needed — I had them along with the requisite (inexpensive) gear. If you are interested in growing your own food (and better food than money can buy!) — you are in the right place! But if you want to go beyond that in your preparedness plans and enhance your communication abilities with low power Morse code, I would encourage you to get in touch with the American Radio Relay League to get your license, and with the North American QRP CW Club to get pointers on QRP and learning Morse code. I have worked long and hard to write what I believe to be the most comprehensive book out there on caveman diet, and it will be available in the spring. Among the subjects I covered was the impact of gut bacteria on behavior. There are so many neurons in your gut that some scientists call the complex of nerves in your abdomen “the second brain.” Much more information flows TO your brain from your gut than vice-versa. Bacteria in your gut secrete various substances based upon both the species of bacteria and the diet those bacteria are fed. Your immune system, your environmental exposures and your diet will all effect which bacteria are in your gut, the substances made by those bacteria, and thus the effect on your brain. NPR recently did a short segment on the way gut bacteria affects your brain, and I think you’ll find it interesting. With so many people suffering from anxiety and depression, it is worth considering that a short fast followed by a purge with saline laxative and replenishing with a broad-spectrum probiotic could be more helpful than a whole pharmacy full of pills. In celebration, here’s a DRM-free mp3 download of the spooky song “Frozen People” from my White Sky album. The song is protected by copyright so you can’t redistribute or sell it, but I encourage you to download it for your own personal listening. The vocals in this are by the extraordinary Veela, and the music is composed, recorded and produced by me when I’m not busy Mini Farming! Filed under: Fun | Comments Off on Spooky Music for Halloween! Gluten is the protein that makes wheat flour such a delight for spinning into pizzas and stretching into pie crusts. But only a tiny fraction of the world’s population — about 0.6% — has genes that make them immune to problems with gluten sensitivity. Everyone else — 99.4% of the world’s population — is at risk of developing health problems related to gluten consumption. Dr. Tom O’Brien has organized a number of experts on the subject who will be interviewed on video for The Gluten Summit. If you are unfamiliar with the interactions of gluten throughout the body, you may think of issues attributed to gluten as being fringe or even junk science. Even worse, it may even seem trendy. But the qualifications and positions of the 29 people interviewed for this event show that this is REAL science — and like all real science, it is ahead of the dominant mode of thinking. The event itself takes place on-line and in real time for free. Simply register at The Gluten Summit, then log in and watch. The Gluten Summit is online from Nov 11-17. I’ll be logging in specifically to see Dr. Allesio Fassano, Dr. Loren Cordain and Erica Kasuli though many other very interesting folks will be interviewed. If your health is less than you’d like, you have autoimmune diseases, irritable bowel syndrome, anxiety or depression or are just curious — I encourage you to take the opportunity to sign up and listen to what these folks have to say. Filed under: Health | Comments Off on Learn More About Gluten! Fall is the Time to Get Ready! The best time to get your beds ready for next year, or prepare beds for the first time, is in the fall. The reason is because MiniFarming relies on organic methods, and organic methods though superior in the long run, are slow. The additions made to beds — alfalfa meal for slow nitrogen, compost, dolomitic lime and similar materials — are not instantly available. Instead, they need time to break down and become fully incorporated. It’s also inevitable that certain weeds will escape your notice over the growing season. These should be pulled in the fall before they set seed because if you wait until spring, their next generation will become a problem. Instead, pull them in the late summer or early fall before they have dropped their seeds. Fall is also the best time for sowing cover crops. Keep in mind that bacteria is the actual engine that powers your soil. Bacteria act as a translator between the minerals in the soil and the plants you are growing. Making a bed utterly sterile for the winter by removing all plant materials can starve out the bacterial populations that have been thriving all season, and a cover crop helps to keep them in good shape. If a cover crop is not practical, then at the very least cover your bed with a couple inches of compost to give them something to work on. Time in the late summer and fall is a bit less frenzied as well. In the spring, to get the most out of your season — especially here in the Northeast — you need to plant on a pretty tight schedule. Onions get transplanted in early April, cole crops get transplanted in late April, and so forth. Given that we often have snow on the ground until late March, that doesn’t leave a lot of time. If you incorporate your amendments in the fall, that leaves you time for last minute weeding, bed preparation and repairing bed frames before planting at a more leisurely pace in the spring. Filed under: Self-Sufficiency, Vegetables | Comments Off on Fall is the Time to Get Ready! BMI, also known as Body Mass Index is a simplistic notion that only a government bureaucrat could love. It divides your weight in kilograms by the square of your height in meters. If your BMI is greater than 30, you are obese. If it is greater than 25, you are overweight. If it is lower than 18.5, you are underweight. The problem with BMI is that for those who are athletic, especially those who are quite muscular, it vastly overestimates how much body fat they have. On the other hand, for those who are sedentary and soft, it vastly underestimates how much body fat they have. I have attached two pictures of myself taken in the past month. According to the government and insurance companies, even though you can see my ribcage, I am not merely overweight — I am OBESE. Though I’ll grant that maybe I could stand to lose five pounds for greater abdominal definition, I am most certainly not obese, and am well within a normal and healthy weight range. And I am not alone. The simple fact is that I double-dig garden beds, split firewood, swing kettlebells and otherwise develop plenty of muscle that is much heavier than fat. And lots of other people do those things too. But all of these people are also labeled as overweight or obese. Because statistics about obesity are based upon BMI, and BMI labels guys like me who do lots of pushups as “obese” — those statistics are not meaningful. There are millions of people who skew the results. There are many other measures that are far more reliable in determining whether or not someone is overweight. Body fat percentage is a far better measurement. It used to be that you’d have to use calipers and skin folds or an immersion tank to measure body fat. But nowadays, you can use a simple tool that you grasp with both hands that uses bioelectrical impedance to measure your body fat. Just use it a couple of hours after your last meal and the results will be accurate. I have one that cost about $30. Just measuring your waist also works. Is your waist bigger than your hips? Then you are overweight. This concept is not rocket science. You can usually tell if you are overweight or not with the naked eye. If not, then a simple tape measure will do the trick in most cases. As an added check, measuring body fat percentage using bioelectrical impedance is inexpensive and accurate. BMI is unnecessarily complex and based on a host of assumptions that are inaccurate for both fit and sedentary people. The problem is that public health agencies are using this erroneous measure as a way of setting public policy, and I’m sure at some point insurance companies will start using it if they haven’t already. But you and I are neither governments nor insurance companies, so we can feel free to ignore ideas that are clearly flawed, and replace those ideas with measurements that actually work such as body fat measurement and the trusty tape measure! The time soon arrives when hunters all across America will stalk the elusive whitetail deer. North America’s most sought game animal has superior hearing, eyesight well into the ultraviolet range and a nose with more scent receptors than a dog. Scent control is job #1, particularly when still hunting from the ground. There are a lot of expensive products on the market to help with scent control, but if you are a Mini Farmer, you already have everything you need to do it for free. Hang them outside to dry instead of using the drier, which is probably permeated with dryer-sheet smells. No matter what, during the day, your natural body odors will start to permeate the clothes. That’s when a cover scent comes into play. Here is what I do. After washing and drying my clothes, I go get some finished compost (about a cup) from my pile, and put it in a drawstring muslin bag. I put that bag and the clothes into an unscented trash bag, and knot it. I leave it like this in the wood shed for a couple of weeks before the clothes will be used. When I pull out the clothes, they are filled with a nice earthy compost scent that will last all day. If you are a MiniFarmer, you already have borax because you use it for micronutrients in your beds, and you already have compost. Baking soda is in every cupboard. So, for zero extra cost, you have everything you need to remove human scent from your clothes and replace it with a natural cover scent.